Wow, thank you so much, I never thought of that would be a permission issue because my guest login... many thanks!!! If I'm understanding it correctly, you just need to set up the "All" fields layout as available to the user group, under the users and permissions options dialog. After years of using this new web interface, I just found out that on your sample website (http://5.95.74.202/index.html), I can display webpage grid layout with "ALL" fields of the PDFs, not just the "Standard" fields as the sample template provides. Would you please provide the webpage grid layout temp for "ALL" fields? I need to display the date/time of modification, so I can list them easily. Thanks and wish you a very happy new year! In your last post you referred you were using an older version, so what version you have? Check the version in the about box, menu Help>About. You just need to download and install the advanced web interface client. The download is in the first post of this forum thread, file PDFEWIJCSetup.zip. Have you installed it already? After installing it, you just need to start the PDFE web interface and open your browser in one of the suggested URLs. author % author% and so on is shown. Interesting! You are seeing the standard web interface client template html page. Somehow, it is failing to load correctly or you are doing something wrong. What is your Windows version and what language you have set for non-Unicode programs (under the Windows regional settings)? The standard web interface also works without the sufolders checkbox checked, as you can see if you go to the demo site (link in the first post of this thread). Something is not working on your side, but I need your answers to my above questions to get a better idea of what may be wrong. hey i just wanted to know how do we enable thumbnails extraction. i enable thumbnails but no image is shown at the place specified for thumbnails. is there something i am doing wrong .i must mention that i have applied it as web interface for local server client network in office. It is supposed the above linked advanced web interface client installer correctly configures the thumbnails functionality. Have you installed it already? Previous versions needed the installation of the third-party tools Ghostscript and ImageMagick, but this new version of the client includes a built-in solution. The thumbnails functionality is not provided by PDFE itself. It needs an external tool for that. You can read more about it in the help file. furthermore, if a client uploads a file, it just doesnt get updated on the list shown unless DB Distktree is clicked on the server. ?? You need to define a folder monitor to the related disk/folders so it can detect the new files and index them in the database. Do it under the menu Database>IndexerSettings|FolderMonitors. Older version of what? PDFE or advanced web interface client? If the usage of an Internet browser is not an requirement, you can use any other development environment to create your own custom PDFE web interface client, e.g. to even create a stand alone desktop application. Perhaps you can recommend a tool that can help? I've used the Spket IDE. But if you are not used to this, I would recommend that you start coding your client from scratch, using the last version of the ExtJS framework, and an ExtJS GUI designer. Use my sample client only as a source to better understand the usage of the PDFEWI API. - rank the search using any available metric; at the moment the results are sorted by alphabetical order in the of filename and (sub)directories. Is there a way to rank by number of hits per document? You can sort clicking the grid columns, and obviously you can use only the available data. "Hits per document" is not a field provided by PDFE, so you can only implement that functionality if you use a server side way to save/access that data. This can be easily achieved with a php server side script that acts as a proxy to the client requests. 4. Is there a way to pass the searched terms to Acrobat Reader's advanced search? Acrobat's advanced search will show the actual page and sentence-context when searching. You can use the searched terms to construct the url used to show the PDF, for results returned for indexed text content searches. 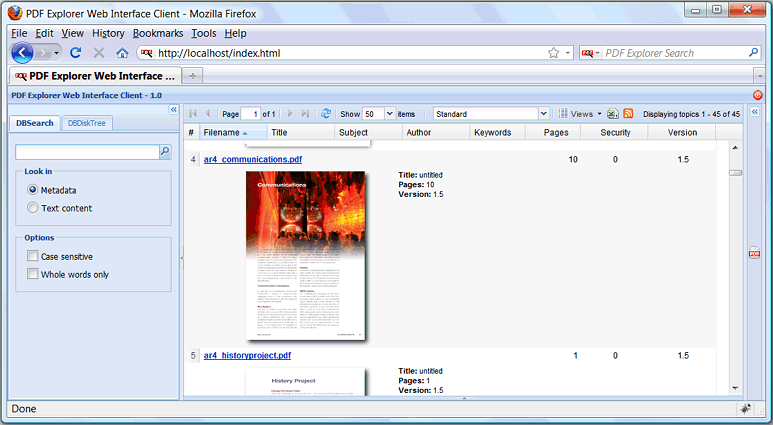 Just to present, and talk about, of an advanced PDF Explorer web interface client. And here's an online demo, of both the standard client (html template based), and the advanced API based client. File uploads are enabled, so if you have a PDF or CHM sample to add to the list... But not big files, please.